These down-market areas are strung out along the Ali Hassan Mwinyi Road and the New Bagamoyo Road heading north. Kinondoni just north of Selander Bridge is closest to the city centre and is the focus for a new joint initiative of the United Nations human settlements agency UN Habitat and the Tanzanian and Chinese governments to build new cheap housing units for low-income residents. North of Kinondoni lies Mwenge, which has decentralised government offices, the Tanzanian Celtel headquarters, the post office college, Tanzania Broadcasting Corporation (TBC I), Independent Television (ITV) and the national examinations council. There is also a major terminal for buses running into the city centre, as well as a large crafts market selling woodcarvings by the Makonde people of southern Tanzania. 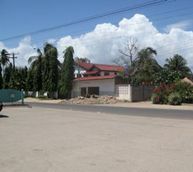 Furthest north is Kawe at the junction of the New Bagamoyo and Old Bagamoyo roads. Local buses travelling into the centre of Dar es Salaam start and end their journey here and the area is busy with people and traffic. There are plenty of small shops and a large market. Between Mwenge and Kawe lies Lugalo, a predominantly military area with army barracks and a military hospital.